We’d love your help. Let us know what’s wrong with this preview of Lunch Lady and the Cyborg Substitute by Jarrett J. Krosoczka. To ask other readers questions about Lunch Lady and the Cyborg Substitute, please sign up. This is the review of my 7 year old daughter Sydney. I did not like this book and I did not finish reading it. The book is like a comic book and there are lots of pictures but not a lot of words. I like books that have more words in them. I thinks that boys (and maybe some girls) will like this book more than me. I won't read any other books in the series. You can tell that author and illustrator Jarrett J. Krosoczka has a pass ion about comics and graphic novels through this book. It’s amazing that the illustrations only include the colors yellow, gray, and black, yet readers are swept away into this animated world. Because there is a lot on each page, more colors may have been more distracting to the reader. The transitions between scenes and conversations are so smooth that I literally felt like I was watching television. I could imagine it so You can tell that author and illustrator Jarrett J. Krosoczka has a pass ion about comics and graphic novels through this book. It’s amazing that the illustrations only include the colors yellow, gray, and black, yet readers are swept away into this animated world. Because there is a lot on each page, more colors may have been more distracting to the reader. The transitions between scenes and conversations are so smooth that I literally felt like I was watching television. I could imagine it so vividly in my head that I completely forgot that I was reading. Not only are the pictures engaging and fun to look at, this book is hilarious and would be a perfect pick for children who either hate reading, or just appreciate comics and cartoons. The three kids in the book are just a bunch of average kids that are very relatable. The lunch lady’s job is not only to serve delicious meals but to serve justice. It is a random, perfect plotline for a humorous, engaging superhero story. Jarrett Krosoczka packs so much into this little book—interesting weapons, secret boiler rooms, and crazy robots. To me, the best part is just how great the expressions and each character are. These illustrations do the storyline justice, and even increase the effectiveness of this graphic novel! Some may argue that there is too much going on in each page and perhaps younger children will turn away from this book due to the amount of stimulus packed in, but I feel like second to third graders will truly appreciate this book! The Lunch Lady thwarts evil with the help of her gadget making fellow lunch lady Betty!! The boiler room is home to their secret hideout, with gadgets galore and surveillance of the entire school they can see trouble before anyone else knows it is there. Lunch Lady is extremely hilarious. It's about three kids that find out that their lunch lady is a secret agent/spy. The kids find out that she uses food and kitchen gadgets as spy tools. For example, a banana boomerang, a spatula helicopter and taco vision goggles. The lunch lady is on a mission to find out why the teachers who never missed a day have a substitute. The kids accidentally stumble upon it and get captured. I am not going to spoil it so I'll stop there. I think it would have been b Lunch Lady is extremely hilarious. It's about three kids that find out that their lunch lady is a secret agent/spy. The kids find out that she uses food and kitchen gadgets as spy tools. For example, a banana boomerang, a spatula helicopter and taco vision goggles. 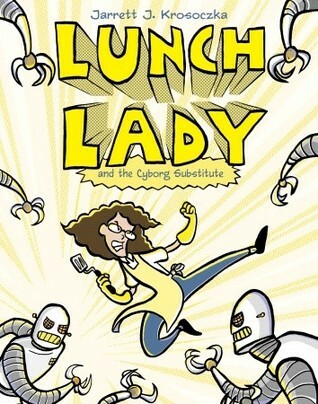 I think it would have been better if the author had put in more gadgets and gave the lunch lady have a robot side kick. It would have been nice if she could have added a tiny bit more action (not that it has no action). This very silly graphic novel is quite a bit of fun. A unique superhero battles the forces of evil in a supposedly ordinary grade school. How the alliances began between the Lunch Ladies and the kids who are in on their crime-fighting secrets. Silly and fun. All I'll say is...SPORK PHONE! Great early graphic novel with boy/girl appeal. Perfect for classroom visits. Would you believe that I have never read a LUNCH LADY book? It is laugh-out-loud funny! Just the thing for kids who think that they don't like to read. I like this book because I love comics. I bet lots of other people like comic books too. I have many favorite parts in this book. 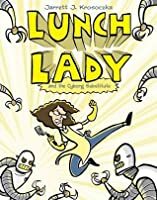 The graphic novel, Lunch Lady and the Cyborg Substitute, by Jarrett Krosoczka, is a hilarious story of a lunch lady and her assistant who equip themselves with high tech kitchen gadgets that help serve and protect the community and school they work for. This book is geared for children (male and female) ages 7-10 years old. The novel begins when Lunch Lady becomes suspicious of an absent teacher and his sinisterly odd substitute. While Lunch Lady (this is her name) and Betty (her assistant) are The graphic novel, Lunch Lady and the Cyborg Substitute, by Jarrett Krosoczka, is a hilarious story of a lunch lady and her assistant who equip themselves with high tech kitchen gadgets that help serve and protect the community and school they work for. This book is geared for children (male and female) ages 7-10 years old. The novel begins when Lunch Lady becomes suspicious of an absent teacher and his sinisterly odd substitute. While Lunch Lady (this is her name) and Betty (her assistant) are working the case, three students deemed “The Breakfast Bunch” become very curious about Lunch Lady and her day to day duties. Of course, they assume she is a boring woman with no life outside the cafeteria…but soon enough they will find out just how important her role is at the school. This graphic novel was nominated for the 2010 Will Eisner Comic Industry Award Nominees under the Best Publication for Kids Award. There are not many heroes with a more passionately divergent alter ego. The clever touches of superhero lunch gadgets throughout the book are supported by the inventions Betty has created for Lunch Lady. Krosoczka does a brilliant job of tying together lunch themes with superhero qualities. Case and point…the hidden lab behind a fridge where Betty has spent her time inventing weapons such as helicopter spatulas, exploding chicken nuggets, a lunch tray laptop, and my personal favorite…the fish stick numb chucks that assist Lunch Lady as she serves and protects the student body. Not only do the gadgets keep the reader entertained, but the dialog contains cafeteria talk; meaning food-inspired statements and quotes. Classic statements such as “oh no!” are replaced with “good gravy!” will make any student laugh aloud. One of my favorite parts is the view of the spy screens in the Lunch Lady's lab; showing what the teachers are doing in their classrooms. For instance, we learn that "Mr. Johnson is reciting poetry" to and of course the poem he is reciting begins with food, "Beans, beans, good for your heart..." before trailing off to be completed by laughing readers. In addition, the yellow-highlighted pen-and-ink cartoons drawings filled with silly puns are energetic yet simple which alternate keep the readers’ visual interest. I selected Lunch Lady and the Cyborg Substitute, by Jarrett J. Krosoczka, based on recommendations from my school LMC director and local public librarian during the fantasy/science fiction book search. Lunch lady is superheroine who is the school lunch lady for three kids, Hector, Dee, and Terrence. The three wonder what type of life Lunch Lady and her assistant, Betty, lead outside of school and imagine a boring life with lots of cats. They devise a plan to follow Lunch Lady home to satisfy the I selected Lunch Lady and the Cyborg Substitute, by Jarrett J. Krosoczka, based on recommendations from my school LMC director and local public librarian during the fantasy/science fiction book search. Lunch lady is superheroine who is the school lunch lady for three kids, Hector, Dee, and Terrence. The three wonder what type of life Lunch Lady and her assistant, Betty, lead outside of school and imagine a boring life with lots of cats. They devise a plan to follow Lunch Lady home to satisfy their curiosity. Lunch Lady and Betty are actually superslueths and investigate the odd behaving substitute teacher (actually a cyborg) who replaced Mr. O’Connell, a teacher favored to be the Teacher of the Year. Down in the school boiler room, Lunch Lady and Betty have a test laboratory used for creating “tools of their trade” from kitchen and food items like chicken nugget bombs, cannoli-oculars, and a spatu-copter. As this adventure peeks, the kids witness Lunch Lady performing superheroine feats such as leaping from a tall building (the school) onto her super powered moped, attacking cyborg robots with her fish stick nunchucks, and saving the kids from peril by using her spatu-copter to fly them well above the dangers of cyborg attacks! Krosocska uses ink on paper and digital coloring of yellow, black, and shades of gray to create visual interest in this graphic novel. His cartoon characters accentuate the facial expressions and actions of the characters highlighting the superhero fantasy elements of this chapter book. The main character is a school lunch lady who is a kind of super-hero within the school. This is a funny beginning because we don’t usually think of lunch ladies as being heroes. In this story, a substitute math teacher has been brought in for Mr. O’Connell and is giving the students a ton of homework. The lunch lady is suspicious of the substitute teacher because Mr. O’Connell has never before missed a day of work. She sneaks around and tries to find out more about the substitute. She follows The main character is a school lunch lady who is a kind of super-hero within the school. This is a funny beginning because we don’t usually think of lunch ladies as being heroes. In this story, a substitute math teacher has been brought in for Mr. O’Connell and is giving the students a ton of homework. The lunch lady is suspicious of the substitute teacher because Mr. O’Connell has never before missed a day of work. She sneaks around and tries to find out more about the substitute. She follows him home one day after school and finds out that he is actually a robot living a warehouse. The person running the robots is the science teacher, Mr. Edison. Mr. Edison’s evil plan is to make the other teachers look bad by sending in robots so that he can be named as teacher of the year. The lunch lady is able to solve the case with the help of the three main children characters, who help her destroy the cyborgs with a remote control. The book was fun and funny to read. The lunch lady has a lot of humorous gadgets that she can use to help her solve the mystery. One of my favorite parts is that her apron is her cape – a cape on her front instead of her back. I think this is probably a good transition book, helping students who might not be entirely ready for a chapter book and would probably be appropriate for readers in 3rd grade and up. It was easy to follow with the pictures and made me think about how a cartoon would portray the story. If you like Batman and Spiderman, we think you’ll love Lunch Lady! By day, she serves lunch and by night, she secretly fights crime. In our opinion, the Lunch Lady series books are the best action packed novels to read in any grade. There are funny characters in the series of Lunch Lady. Lunch Lady says funny things like, “Oh my! Sweet potatoes!” Betty is Lunch Lady’s sidekick! And makes silly gadgets. There is also the Breakfast Bunch. They are always involved with problems. We love these craz If you like Batman and Spiderman, we think you’ll love Lunch Lady! By day, she serves lunch and by night, she secretly fights crime. In our opinion, the Lunch Lady series books are the best action packed novels to read in any grade. There are funny characters in the series of Lunch Lady. Lunch Lady says funny things like, “Oh my! Sweet potatoes!” Betty is Lunch Lady’s sidekick! And makes silly gadgets. There is also the Breakfast Bunch. They are always involved with problems. We love these crazy characters! One reason the Lunch Lady series is hilarious is that she goes on crazy adventures. For example, in one story Lunch Lady was attacked by bunnies and it was really surprising! Another time a sea monster attacked the summer camp and Lunch Lady was already on the case! You’ll have to read more to find out what happens next. Our last reason Lunch Lady series is the best is because of its awesome gadgets like chicken nugget bombs or hover pizza. “I love the taco vision night goggles,” said Lillian. Abbi said, “The hover pizza is cool.” Also, Nicole said, “The hot sauce laser is spectacular.” We think that the gadgets are so awesome! Fun graphic novel series for chapter book readers. Lunch Lady and her sidekick, Betty, are a secret crime-fighting duo that serve up breakfast, lunch, and justice. There is a group of three elementary school kids (two boys and one girl) who help Lunch Lady and Betty on their superhero missions. Lunch Lady's ninja skills are complemented by Betty's tech acumen. My favorite part are all the souped-up cooking utensils and food-related gadgets that Betty invents, which are then used to capture the bad guys. For the same age group as readers of the Babymouse and Salem Hyde graphic novel series, but the Lunch Lady series has wider appeal to both genders. Nothing deep here, but good entertainment value when kids need a break from more serious reading and studying. Especially well-suited to build reading confidence for reluctant readers. Not a lot of detail in the drawing. This more iconic style, along with large panels, makes these graphic novels easy to read. Color palette is restricted to black, white, and yellow for all books in the series. I wish the creator had chosen a more contrasting color than yellow, but it works well for the apron and gloves of Lunch Lady's outfit. 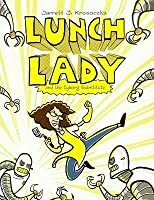 In this first book of the Lunch Lady series, Lunch Lady and her helpers must foil an evil plan to replace teachers with robots. This is a graphic novel about Lunch Lady who is a super-hero. She's suspicious of Mr. Pasteur, a substitute for one of the regular teachers. Three students, Hector, Terrence, and Dee wonder what the Lunch Lady does in her personal time, outside school. To spy on her, they follow her while she is pursuing Mr. Pasteur. She discovers that Mr. Pasteur is a Cyborg Substitute. 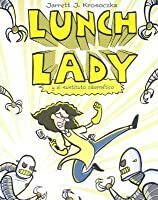 The kids and Lunch Lady follow Mr. Pasteur and figure out that he has kidnapped Mr. O'Connell, the teacher he was substituting This is a graphic novel about Lunch Lady who is a super-hero. She's suspicious of Mr. Pasteur, a substitute for one of the regular teachers. Three students, Hector, Terrence, and Dee wonder what the Lunch Lady does in her personal time, outside school. To spy on her, they follow her while she is pursuing Mr. Pasteur. She discovers that Mr. Pasteur is a Cyborg Substitute. The kids and Lunch Lady follow Mr. Pasteur and figure out that he has kidnapped Mr. O'Connell, the teacher he was substituting for. They save him and the kids realize they can stand up to bullies just like the Lunch Lady stood up to Mr. Pasteur. The illustrations are detailed and tell the story along with the written words. I thought this book was okay but not one of my favorites. It was somewhat hard to follow and the story line was goofy. It did not really hold my interest like other books. Appeal: This is a humorous, action packed graphic novel in the vain of a Captain Underpants without the potty humor, and negative adult references. Students that like adventure that takes place with little known school figures, like a lunch lady, will enjoy this book. The lunch lady fights crime using food utensils, and food humor like "what would you like a knuckle sandwich, you bet your ketchup I am, or chicken nugget bombs". This is a series so if a student gets hooked on this book, there are many more books with the lunch lady as the superhero. What a cute graphic novel for grades 2 to 5. I picked this up because I work as a lunch lady in an elementary school so I could relate to the story. The book is told in pictures but only uses the colors yellow, black and white. It is quite comical how the main character fights off crime using kitchen utensils and I too in real life have questioned some substitutes with their odd behavior. There are other books in this series. I enjoyed this book because I liked the part when lunch lady destroyed all the robots. I also enjoyed this book because I liked the part when Mr.Edison was captured. super cute graphic novel for kids :) had me laughing at all the food stuff! Cute graphic novel for J readers. I love that a lunch lady is the hero of this series - fun to read! I liked this book because i think that it is cool how the lunch lady came up with super cool gaits. So cute! Literally read it in 5 minutes. This would be perfect for kids. A cute story. I love all the lunch lady related gadgets. Recommended by a fourth grader at the Catholic school. Summary: This book is about three students who are interested in the life of their lunch lady outside of school. They also have this new substitute teacher there in replacement for their favorite teacher who had never missed a day of school before. There is something fishy about the substitute teacher so the lunch lady, who actually is a secret agent, follows him, and the kids follow her to find out who she is. The lunch lady saves the school from be attacked by the Cyborgs. Review: : I like thi Summary: This book is about three students who are interested in the life of their lunch lady outside of school. They also have this new substitute teacher there in replacement for their favorite teacher who had never missed a day of school before. There is something fishy about the substitute teacher so the lunch lady, who actually is a secret agent, follows him, and the kids follow her to find out who she is. The lunch lady saves the school from be attacked by the Cyborgs. Review: : I like this book; it had some really good morals. It addressed bullying and standing up to the bully. The illustrations really matched the text well so struggling readers could use the pictures to read the story. I might pair this book with other books about bullying during a bullying unit in my classroom. Juicy Quote: "Mr. Edison may just be the coolest teacher we have! Well, I know who's getting my vote for teacher of the year. Are you guys ready for operation Lunch Lady?" This quote can be used to teach children about making predictions. This quote is the beginning statement of what the whole story is about, so students can create really juicy predictions from it. This book is about a lunch lady who likes to cook (obviously) but she knows if something is wrong with the teachers of students. So there was a substitute who look suspicious so the lunch lady and her friend was following the sub home and the sub was controlled by someone...... read the book to find out. "The Lunch Lady and the Cyborg Substitute" was an amazing book, and I even enjoyed it as a college student. I normally do not prefer graphic novels and comics, because they can be difficult to read and you need to interpret the picture and text together. This graphic novel was so entertaining and funny, I read it in about a half hour, even though it is about 60 pages. I could easily read it again because there were many details in the illustrations that I did not catch the first time. The story "The Lunch Lady and the Cyborg Substitute" was an amazing book, and I even enjoyed it as a college student. I normally do not prefer graphic novels and comics, because they can be difficult to read and you need to interpret the picture and text together. This graphic novel was so entertaining and funny, I read it in about a half hour, even though it is about 60 pages. I could easily read it again because there were many details in the illustrations that I did not catch the first time. The story takes place in a school and centers on three students, Hector, Terrance and Dee. They wonder what their lunch lady does, and begin to follow her. They discover that she is a spy, after deciding to risk getting in trouble and follow the lunch lady on their bikes. This leads them to a building where the lunch lady is about to discover a big mystery that has been holding the reader in suspense the whole book, and the students learn what the lunch lady is. The mystery surrounds why t Mr. OConnell, the math teacher, is out sick when he hasn't been sick in twenty years. The substitute teacher is peculiar looking and when they find nothing but a CD in his briefcase, and he gets defensive about eating cookies. The book begins with two separate stories of the three students, and the actions of the lunch lady within the same setting of the school. The reader figures out that she is a spy and protector of the school by the first few pages, unlike the students. However by the end, these stories seamlessly integrate into one, and the mystery ties together. What is going on to the teachers in the school? Will the lunch lady and the three students solve it?